NEOVA® is the first clinical skin care company to bring real innovation to the photo aging category by introducing Copper Peptide Complex technology products. These award-winning formulas target photodamaged skin, help to visibly repair it and revolutionize the way women care for their skin. Neova is among the first skin care brands to make the association between DNA damage and premature skin aging and provides complete, continuous and optimized correction with DNA Repair and Copper Combination Therapy skin care. 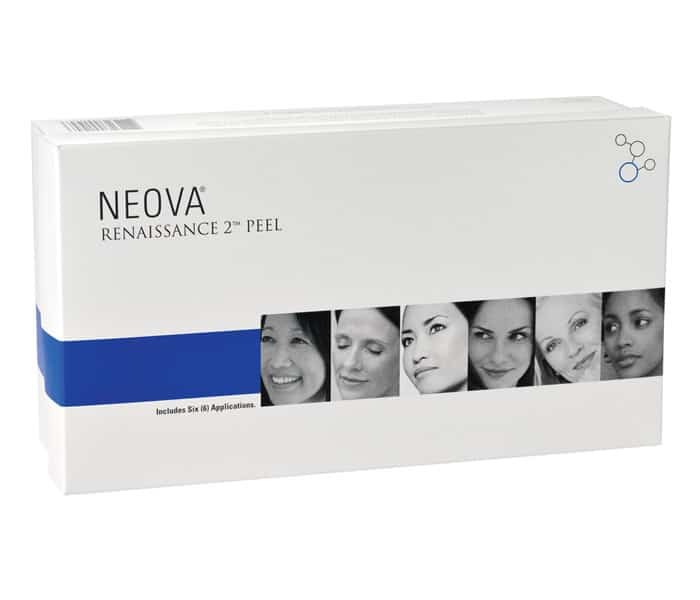 NEOVA® RENAISSANCE 2® PEEL is a powerful, highly effective peel that works to combat the effects of photodamage and environmental assaults. Relying on a specific blend of exfoliating acids – Lactic Acid (AHA), Salicylic Acid (BHA) and Resorcinol – with a pH range of 2 to 3, Renaissance 2 Peel® delivers noticeable improvement after one peel and dramatic results after a series of treatments. And, because of advances in formulating, Renaissance 2 Peel® is better tolerated with your risks and complications.